THIS NEW AGENCY’S GOT LEGS! 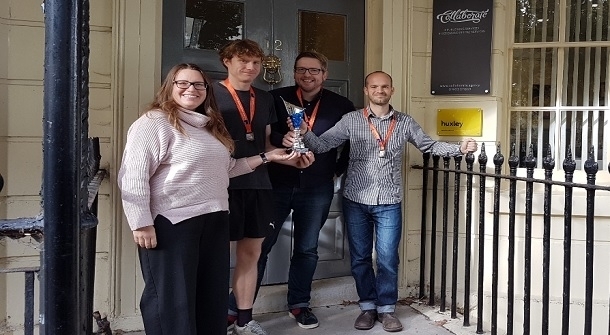 Worthing based web development agency Huxley won the Chichester Half Marathon corporate challenge by distance, with one team member finishing an impressive 20th overall! They beat dozens of other teams, including race day sponsor Montezuma. On winning the challenge, Head of Marketing Tom Lavis said: ​We all run individually because our job involves sitting down all day, and it keeps us physically fit. Of course, we also get the mental health benefits from running too - which contributes to the raport we have as a work team, and the success of our business overall. We’re not surprised we beat a chocolate brand, but to win overall was a bit of a shock! Huxley make progressive websites for businesses who want to stand out online. Their clients include the United Nations, The Norwegian Prime Minister, vloggers Yes Theory!, the South East’s largest ISP Fastnet, Lick Frozen Yogurt, Human Food and more.